1. Candidate Name : This field show the username under which the exam was taken. 2. Date and Time : These fields show the date and time on which exam was taken. 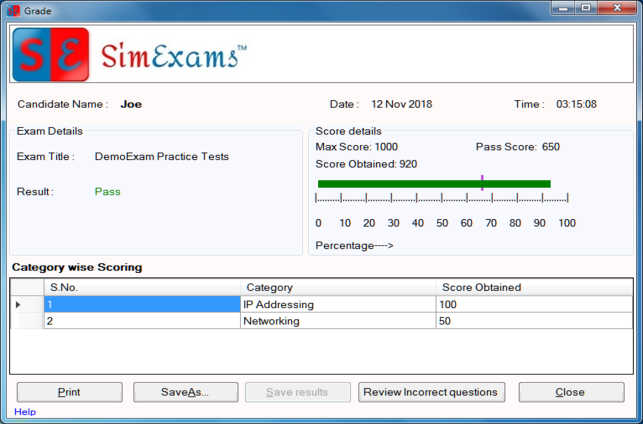 Result : This field will display if the candidate has passed or Failed the exam based on the score obtained in the exam. Score Obtained : This field shows the score which was obtained by the candidate in exam taken. 5. Category Wise Scoring : This section lists all the categories (topics) from which questions were present in the exam and how much the candidate scored in each category. 6. Print : Use this option to print the candidate's performance in grade screen format. 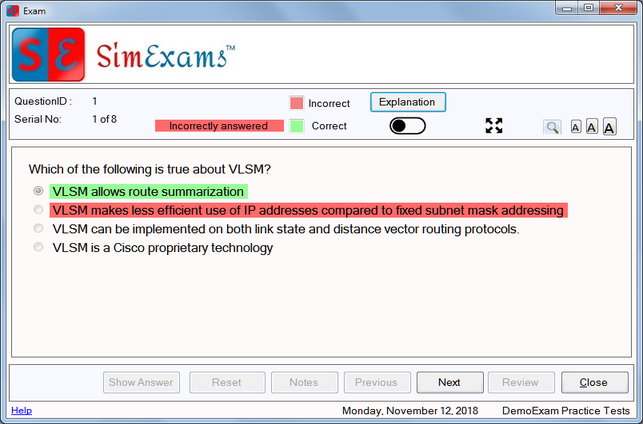 Review Incorrect Question screen will show the answer selected by the candidate (marked in red) and correct answer for the question (marked in green). It also provides the option to view explanation for the question.